Twenty-two years ago, my family and I arrived in Lancaster to begin our work here for the Lord. Generally, when people think of Lancaster Baptist Church, they think of the thriving work that it is today, but it wasn’t always this way. Those first few days in Lancaster were not always easy. At the time, my wife and I didn’t know anyone, nor could the church afford a salary for us. Even through the difficult times, we never doubted God’s plan for us or the ministry here. Bro. Sam Davison brought a powerful message to our church family during the Sunday morning service, in which he reminded each of us that the church is the “pillar and ground of truth.” During the evening service, Bro. R. B. Oullette delivered a message from Luke 5 where we find Jesus challenging his disciples to launch out into the deep. As Christians, we will find the greatest blessing when we launch out by faith and commit ourselves to the work of God. 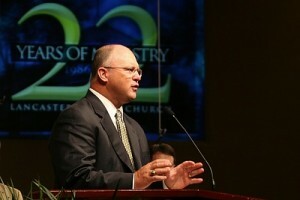 On this 22nd anniversary, I praise the Lord for the great things He has accomplished here at Lancaster Baptist Church. I am privileged to serve Him, and I am excited to see what God has in store for us. Today begins the first day of the Spiritual Leadership Conference. We are excited about this week. During this time we will have pastors and laymen from all over the country and from foreign countries as well join us for a time of edification and growth. Please pray for the Lord to work during this conference.